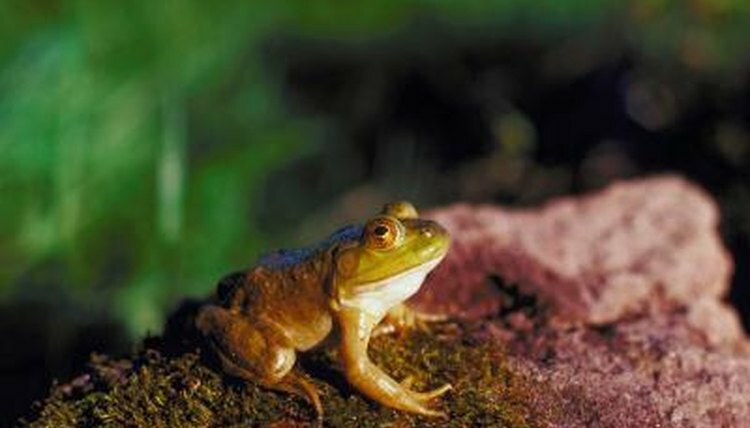 Although frogs have lungs, they perform much of their respiration through their skin, bypassing their lungs completely. Their moist skin is specially designed with tiny blood vessels near the surface to help diffuse oxygen in and carbon dioxide out, even when the frogs are hibernating or underwater. When a frog breathes through his skin, it's called cutaneous gas exchange. This means he's exchanging oxygen for carbon dioxide, similar to the way your lungs exchange the gases. The gases pass through the skin by diffusion. A frog's skin can absorb oxygen, which is captured by capillaries lying just beneath the skin's surface. These capillaries transport the oxygen throughout the frog's circulatory system, carried by the blood. Blood cells not carrying oxygen pick up carbon dioxide and carry it back through the circulatory system to the skin, where it diffuses out of the frog. When frogs hibernate in cold weather, they breathe through their skin almost exclusively. A frog's skin must stay moist for the cutaneous gas exchange to work properly, which is why you see frogs in damp areas, near water and at night most often. The hot sun can dry their skin out quickly, so they tend to only come out during the day if they can dive into some water when necessary or dig under damp soil. Frogs give off carbon dioxide two and a half times faster through their skin than their lungs, which makes keeping their skin moist essential to their survival. Cutaneous gas exchange suffices for most of a frog's breathing needs, but he still has lungs to supplement his oxygen needs. Most frogs breathe through their noses with their mouths closed. Frogs' lungs have relatively thin walls that can act like balloons. When a frog fills his lungs with air, he can hold the air there to help him remain buoyant while swimming. Net Frog: Does a Frog Breathe Through Its Nose? Nature Watch: What are Amphibians?